After a quick 10 minute clean up of yesterday's soiree, I got down to the business of cooking our new year's day breakfast. 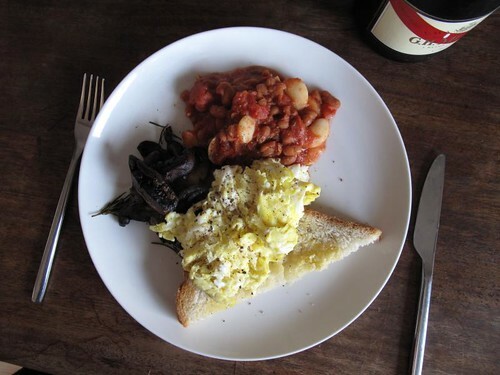 Our first meal of the year; scrambled eggs, rosemary mushrooms and semi-homemade baked beans. I buy the Whole Earth baked beans because I like their cinnamony smokiness, but the problem with this is they tend to take centre stage, and today I want them to to be a bit more of a supporting act so I'm going to simplify the flavours by mixing them with some other beans for some textural variety and adding some tomatoes. Heat a tablespoon of oil in a saucepan, throw in the bay leaf, rosemary, tomatoes straight from the can and the drained butter beans. 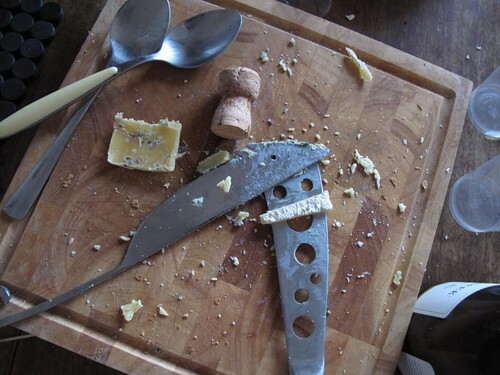 Let it all bubble away for about the time it takes to fry up your mushrooms with some garlic, butter and rosemary, wash a few champagne glasses and take the recycling downstairs. Add the drained baked beans (don't stress too much about draining off all the sauce). Season with salt and pepper and simmer until the eggs and toast are ready. We enjoyed our first breakfast of the year in our pyjamas, listening to the food show on radio 4 and discussing our new year's resolutions, one of mine being to blog more.